Background and objectives In the treatment of CKD, individual patients show a wide variation in their response to many drugs, including renin-angiotensin-aldosterone system inhibitors (RAASi). 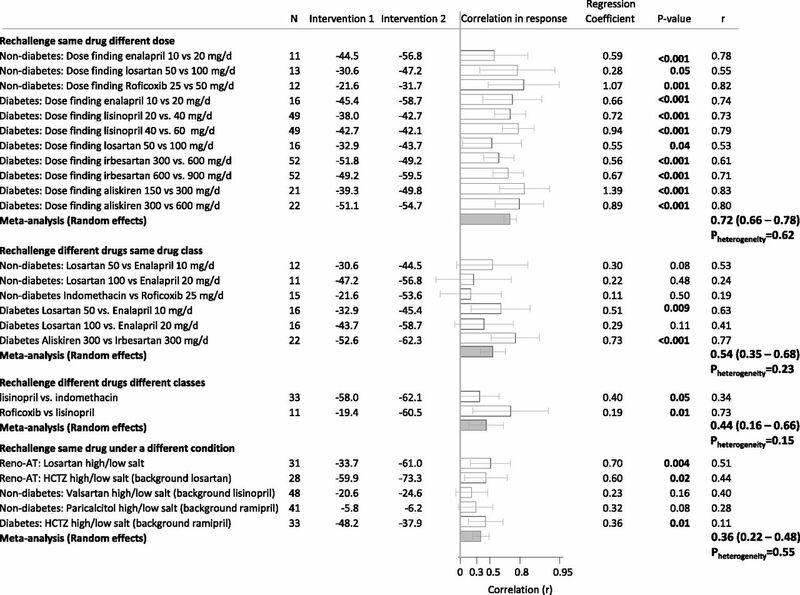 To investigate whether therapy resistance to RAASi can be overcome by uptitrating the dose of drug, changing the mode of intervention (with drugs from similar or different classes), or lowering dietary sodium intake, we meta-analyzed individual responses to different modes of interventions. Design, setting, participants, & measurements Randomized crossover trials were analyzed to assess correlation of individual responses to RAASi and nonsteroidal anti-inflammatory drugs (NSAIDs; n=395 patients). Included studies compared the antialbuminuric effect of uptitrating the dose of RAASi (n=10 studies) and NSAIDs (n=1), changing within the same class of RAASi (e.g., angiotensin-converting enzyme inhibition to angiotensin receptor blockers; n=5) or NSAIDs (n=1), changing from RAASi to NSAIDs (n=2), and changing from high to low sodium intake (n=5). A two-stage meta-analysis was conducted: Deming regression was conducted in each study to assess correlations in response, and individual study results were then meta-analyzed. 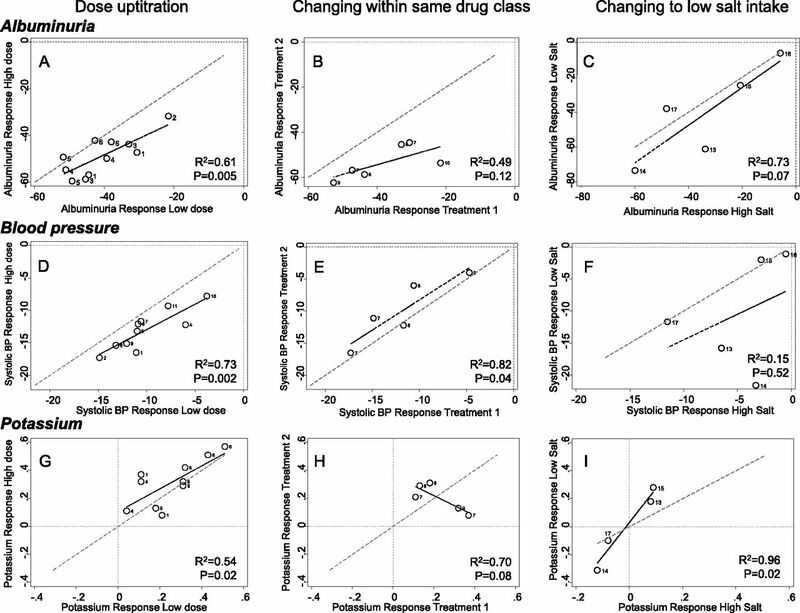 Results The albuminuria response to one dose of RAASi or NSAIDs positively correlated with the response to a higher dose of the same drug (r=0.72; 95% confidence interval [95% CI], 0.66 to 0.78), changes within the same class of RAASi or NSAIDs (r=0.54; 95% CI, 0.35 to 0.68), changes between RAASi and NSAIDs (r=0.44; 95% CI, 0.16 to 0.66), and changes from high to moderately low salt intake (r=0.36; 95% CI, 0.22 to 0.48). Results were similar when the individual systolic BP and potassium responses were analyzed, and were consistent in patients with and without diabetes. Conclusions Individuals who show a poor response to one dose or type of RAASi also show a poor response to higher doses, other types of RAASi or NSAIDs, or a reduction in dietary salt intake. Whether other drugs or drug combinations targeting pathways beyond the renin-angiotensin-aldosterone system and prostaglandins would improve the individual poor response requires further study. Personalized or precision medicine has driven recent therapeutic successes in oncology: each tumor is targeted by a specific drug that eliminates the cells of the tumor (1). This approach of tailoring therapy to the individual patient has gained interest in other areas of internal medicine, including nephrology (2,3). Indeed, patients with CKD show a wide variation in their response to many interventions. Notably, angiotensin-converting enzyme inhibitors (ACEis) or angiotensin receptor blockers (ARBs), the current mainstay of treatment in patients with CKD, slow the progression of kidney disease on a population level. However, not all patients are protected to the same degree. This variability in kidney protection is predicted by the variability in the BP, albuminuria, and potassium responses to the drugs (4–6). Approximately 60% of all patients show a reduction in BP or albuminuria with renin-angiotensin-aldosterone system (RAAS) intervention therapies, and 10% show an increase in potassium (4,5,7). Patients with no response in BP and/or albuminuria and those with a rise in potassium are unlikely to benefit from the drug, and thus remain at high risk to progress to ESRD. Finding alternative strategies to improve the response of these patients will help to personalize treatment and optimize pharmacotherapy. BP and albuminuria responses to renin-angiotensin-aldosterone system intervention (RAASi) can be enhanced on a population level by increasing the dose of the drug (8,9), and by concomitant treatment with diuretics and or lowering of dietary sodium intake (10,11). Whether these strategies would turn a nonresponder patient into a responder is not well established. Another way to overcome therapy resistance could be to replace the ACEi with ARB or vice versa, or to use a drug from another class with a completely different mechanism of action. Some small studies have investigated this, but have reported contrasting results (12,13). We therefore undertook a pooled analysis of individual patient data of multiple crossover studies to investigate whether uptitrating the dose of drug, changing the mode of intervention (ACEi to ARB), lowering dietary sodium intake, or switching to another drug class (nonsteroidal anti-inflammatory drug [NSAID]) would improve individual therapy response (BP or albuminuria) to RAASi. We analyzed individual responses to different modes of albuminuria-lowering interventions obtained in randomized crossover studies in which the same patient was exposed twice to various pharmacologic regimens. We selected randomized crossover studies enrolling adult patients with micro- or macroalbuminuria who were exposed to the same drug at different doses, or drugs from the same drug class, drugs from different drug classes, or the same drug during a liberal and restricted dietary sodium diet. Study selection was on the basis of the availability of individual patient data. We also performed a systematic review of the literature to identify potential additional studies. To this end, we searched Medline via PubMed from 1950 up to November of 2016. The search was restricted to English publications of clinical crossover trials of adult populations. Additional details of the search strategy are described in Supplemental Figure 1. The search identified several additional studies (Supplemental Figure 1). These studies could not be included in our analysis because the individual patient data could not be obtained. The detailed design, rationale, and study outcome for the included studies have been previously published. In six studies, providing data on 11 treatment comparisons, the individual response of dose uptitration was assessed (9,14–18). In four studies, providing data on six treatment comparisons, the individual response was assessed after changing to another drug from the same drug class (i.e., switching from ACEis to ARBs, or from nonselective to selective NSAIDs) (14–16,19). Two studies with two treatment comparisons provided data on changing from an ACEi to NSAIDs (16,20), and four studies, including five treatment comparisons, assessed the individual response after changing from a high to moderately low sodium intake (10,11,21,22). Because NSAIDs did not have an effect on BP in the included studies, and potassium was not recorded in the NSAIDs studies, the individual BP and potassium response to NSAIDs were not assessed. In comparing the individual therapy responses to different modes of RAASi, individual responses were compared for the doses of drugs that had approximately equipotent effects on albuminuria and BP. We therefore compared the following dosages: losartan 50 mg/d versus enalapril 10 mg/d; losartan 100 mg/d versus enalapril 20 mg/d; and aliskiren 300 mg/d versus irbesartan 300 mg/d. Twenty-four-hour urine collections were performed in all studies for proteinuria or albuminuria measurement in local laboratories. Albuminuria/proteinuria response was assessed as percentage change from baseline. Systolic BP was measured in the clinic by sphygmomanometer (one study), dinamap (four studies), and 24-hour BP measurement device (six studies). Systolic BP response was defined as the absolute change in systolic BP from baseline to end of the treatment period. Potassium was measured in local laboratories in each study and the potassium response was defined as the absolute change in potassium from baseline to end of the treatment period. During the course of each trial, patients were kept on stable doses of concomitant antihypertensive medication. All participants signed informed consent before any study-specific procedures commenced. Normally distributed variables are expressed as means with SD. Non-normally distributed variables were logarithmically transformed before statistical analysis and are given as geometric means and 95% confidence intervals (95% CIs). Treatment response was calculated as a percent change between the baseline and the last measurement of the treatment period, or between the first and the last measurement of the treatment period. A two-stage meta-analysis was conducted. First, comparisons of changes in albuminuria, BP, and serum potassium between each treatment period were performed using Deming linear regression in each study, separately. Secondly, for the purpose of the meta-analyses, the correlations of individual study responses were converted to the Fisher z scale, and random effects meta-analyses were performed using the transformed values. The summary effect and its confidence interval were then converted back to correlations with their 95% CI. Subgroup analyses by study level median values of baseline eGFR, albuminuria, and systolic BP were performed. Multivariable regression analysis was performed within each study to assess whether age, eGFR, albuminuria, and systolic or diastolic BP at baseline was associated with therapy response. A P value of <0.05 was considered to indicate statistical significance (two-tailed test). All analyses were conducted using Stata/SE version 13.1 for Windows (StataCorp, College Station, TX). A total of 221 diabetic and 174 nondiabetic patients from 11 crossover studies providing data on 24 treatment comparisons were included in this analysis. The individual response after exposure to a higher dose was assessed in three comparisons with ARBs, three comparisons with ACEis, one comparison of a direct renin inhibitor (aliskiren), and one comparison of an NSAID. Rechallenge with a drug from the same drug class was assessed in four comparisons of RAASi and one comparison of NSAIDs. Changes from RAASi to NSAIDs was assessed in two studies. The effect of moderating dietary sodium intake was determined during ARB treatment (two comparisons), hydrochlorothiazide treatment (two comparisons), and treatment with a vitamin D receptor agonist. Baseline characteristics of the populations enrolled in each study are presented in Table 1. Median albuminuria levels ranged from 0.09 [(interquartile range [IQR]), 0.07–0.3] to 5.1 [IQR, 2.9–8.1] g/24 h; mean eGFR ranged from 58 (SD=26) to 103 (SD=19) ml/min per 1.73 m2; systolic BP ranged from 126 (SD=11) to 155 (SD=15) mm Hg; and serum potassium levels ranged from 3.6 (SD=0.3) to 4.6 (SD=0.6) mEq/L. Across all studies, the mean albuminuria reduction positively correlated with the mean albuminuria reduction after dose uptitration, so that studies with a relatively small albuminuria reduction during a low dose also showed a relatively poor albuminuria reduction after dose uptitration (Figure 1A). Similarly, the mean albuminuria reduction in each study after rechallenge to an intervention within the same drug class, or rechallenge during a moderately low salt intake, tended to correlate with the mean albuminuria reduction during the first exposure (Figure 1, B and C). These latter correlations did, however, not reach statistical significance, possibly because of the small number of comparisons. Correlation of study average albuminuria, systolic BP, and potassium response to two different doses of RAASi or NSAIDs (A, D, and G), rechallenge to another RAASi or NSAIDs (B, E, and H), and rechallenge during a moderately low sodium diet (C, F, and I). Numbers in the figure refer to the study numbers as listed in Table 1. In (B, F, and I), treatment 1 along the x-axis indicates an angiotensin-converting enzyme inhibitor (ACEi) for study 7 and 8; an angiotensin receptor blocker (ARB) for study 9, and indomethacin for study 10. Treatment 2 along the y-axis indicates an ARB for study 7 and 8, aliskiren for study 9, and rofecoxib for study 10. NSAIDs, nonsteroidal anti-inflammatory drugs; RAASi, renin-angiotensin-aldosterone system inhibitors. Similar results were observed when the study mean BP responses were analyzed (Figure 1, D–F), except that the BP responses during high and moderately low salt intake did not significantly correlate. The mean potassium responses in each study also positively correlated after dose uptitration and rechallenge during a moderate sodium intake (Figure 1, G and I). 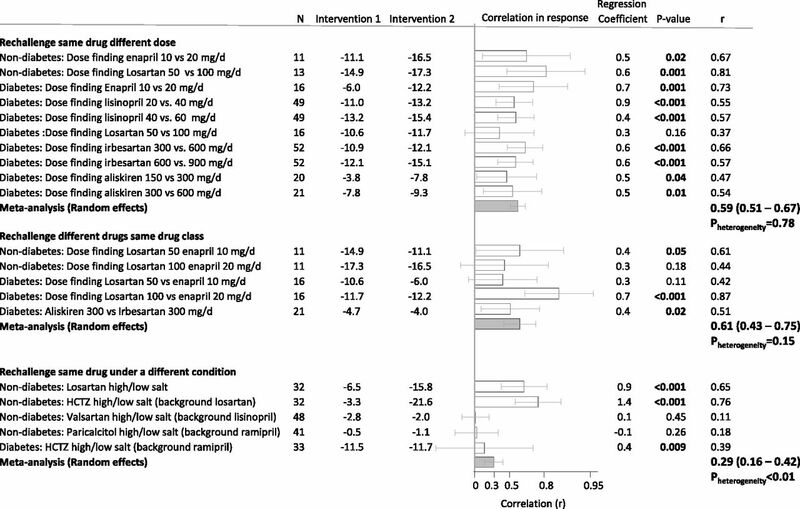 However, a trend toward an inverse correlation was observed when the mean potassium response was analyzed after rechallenge to an intervention within the same drug class (Figure 1H). Within each study, the individual albuminuria response to one dose of RAASi or NSAIDs positively correlated with the individual albuminuria response to a higher dose of RAASi or NSAIDs (Figure 2). This was consistently observed in all studies (P for heterogeneity =0.62), indicating that patients who did not respond to a low dose also did not respond to a higher dose. Similarly, a significant positive correlation was observed after rechallenge to another drug from the same drug class (Figure 2). Interestingly, the individual albuminuria response also showed a significant positive correlation when changing the individual patient from an ACEi to NSAIDs, or when changing the individual patient from a high to moderately low dietary sodium intake, suggesting that individual therapy resistance persisted after rotation to another drug class or changing dietary conditions (Figure 2). Similar results were observed when the individual systolic BP responses were analyzed (Figure 3). Correlation of individual albuminuria responses to two different doses of RAASi or NSAIDs, rechallenge to another RAASi or NSAIDs, changing from RAASi to NSAIDs, and rechallenge during a moderately low sodium diet. HCTZ, hydrochlorothiazide; NSAIDs, nonsteroidal anti-inflammatory drugs; RAASi, renin-angiotensin-aldosterone system inhibitors. Correlation of individual systolic BP responses to two different doses of RAASi, rechallenge to another RAASi, and rechallenge during a moderately low sodium diet. HCTZ, hydrochlorothiazide; RAASi, renin-angiotensin-aldosterone system inhibitors. With respect to the individual potassium response, statistically significant correlations were observed after increasing the dose of RAASi, changes within the same class of RAASi, and changing from a high to low salt intake (Figure 4). This suggests that a patient with a rise in potassium during a high dose of an RAASi (an ACEi or ARB) or during a moderately low salt intake is also likely to show a rise in potassium at a lower dose, another RAASi, or during high salt intake, at least for the doses and drugs used in this study. Correlation of individual potassium responses to two different doses of RAASi, rechallenge to another RAASi, and rechallenge during a moderately low sodium diet. HCTZ, hydrochlorothiazide; NSAIDs, nonsteroidal anti-inflammatory drugs; RAASi, renin-angiotensin-aldosterone system inhibitors. An additional analysis in which studies were divided on the basis of the study median eGFR, albuminuria, or systolic BP demonstrated that the observed correlations were consistent regardless of the baseline values of these parameters (Supplemental Table 1). In addition, a regression analysis conducted within each study revealed that none of the baseline clinical or physical characteristics were associated with a response to any of the interventions. The individual therapy response to renoprotective agents markedly varies between individuals. Developing strategies to improve therapy response and overcome individual therapy resistance is essential to optimize pharmacotherapy in this era of precision medicine. 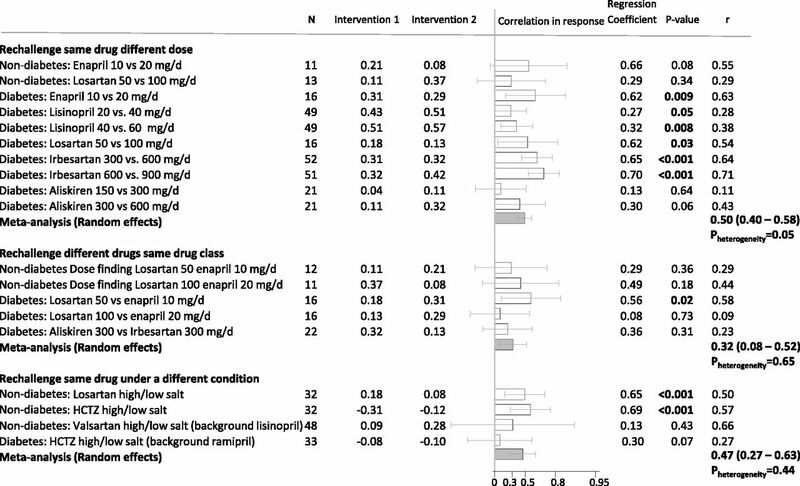 In this analysis of multiple crossover studies, we demonstrated that response to an intervention is markedly consistent for the individual, as evidenced by the similar individual responses after dose titration, re-exposure to different drugs, or dietary conditions. In other words, a nonresponder to one dose or drug remains a nonresponder to a higher dose or another drug, at least for the doses and drugs tested. Intriguingly, this not only applies to interventions within the same class of drugs, but was also observed when switching to drugs with a different mechanism of action. Moreover, the consistency in response to different drugs was observed in both BP, albuminuria, and potassium responses. Taken together, these data suggest that the variability in response seems not to be related to the dose or type of intervention, but is more likely determined by intrinsic patient characteristics, which, in these studies, could relate to the activity of the RAAS. Most drugs that were included in our meta-analyses intervened in the RAAS, which renders it difficult to assess to what extent therapy resistance to RAASi can be overcome with drugs with other mechanisms of action. However, several studies could be included with drugs not directly targeting RAAS. Inclusion of these studies broadened the generalizability and enabled us to demonstrate that the consistency in individual response also applies when changing to NSAIDs. This suggests that therapy resistance cannot be overcome with drugs targeting molecular pathways beyond the RAAS, although we acknowledge that NSAIDs may also indirectly affect RAAS (23,24). Furthermore, NSAIDs are not recommended as alternative to RAASi in clinical practice. Therefore, additional studies are required with drugs approved for use in patients with CKD, and having different targets to assess whether individual therapy resistance can be overcome with other types of interventions. The rotation for optimal targeting of albuminuria and treatment evaluation (ROTATE)-1 and ROTATE-2 trials are designed to investigate the renoprotective individual drug response to four different drugs: an ARB, a sodium-glucose cotransport inhibitor, a dipeptidyl-peptidase-4 inhibitor, and sulodexide (clinical trial identifiers: NTR5602 and NTR5603). Individual patients will receive 4 weeks of treatment with each drug in random order followed by a 4-week confirmatory period, during which the optimal drug for each patient will be repeated. These trials will provide further insight in determinants of individual response variability as well as clues on to how to optimize individual therapy response. High extracellular volume status has been shown to blunt the response to RAASi (25). Accordingly, extracellular volume restriction by means of diuretic treatment or low salt diet improves the renoprotective response to RAASi in both nondiabetic and diabetic patients with kidney disease (10,11). We note that in our study, the correlations in individual albuminuria and BP responses after changing from a high to low salt diet were weaker compared with other methods of enhancing the individual response. The weaker correlations suggest that in some settings, particularly where patients received background RAAS medication, individual patients may have benefitted from lowering dietary salt intake. The results from this study suggest that therapy resistance in patients with high albuminuria is related to specific patient characteristics, as the individual response is more or less consistent regardless of the dose or type of intervention. The level of kidney function, albuminuria, or presence of diabetes appear not to be determinants of the individual response as the data were consistent in patients with and without diabetes, at low or high eGFR levels, and with micro- or macroalbuminuria. In addition, clinical characteristics including albuminuria, BP, and eGFR were not associated with the individual therapy response. Further studies are needed that focus on the patient’s specific genetic or molecular profile to unravel the underlying mechanisms of therapy response. In contrast to oncology, where deep-phenotyping has contributed significantly to discovering determinants of therapy response, precision medicine in the field of nephrology has yet to be implemented (26). However, improvement in experimental techniques and technologies offers the potential to better understand molecular mechanisms of therapy response. Detailed analysis of kidney biopsies, in analogy to oncology, may lead to specific strategies to target medication toward kidney lesions. Additionally, emerging urinary proteomic and metabolomic studies in nephrology will likely help to develop new standards of therapeutic monitoring and selection of treatment regimens (27,28). The consistency in individual response between individual patients was observed for the albuminuria, systolic BP, and potassium response. One could interpret this finding as if patients who responded in albuminuria also showed a BP and potassium response. However, this specific question on the response in these parameters in the same patient was not investigated in this study. Previous studies have already shown that responses in these parameters do not parallel each other within an individual (29,30). In other words, a patient may experience a reduction in albuminuria but no change in BP or potassium. This so-called discordance in response is not only observed with RAASi but has also been shown for other drugs used in patients with diabetic or nondiabetic kidney disease, such as endothelin receptor antagonist, statins, sodium glucose cotransporter inhibitors, or glucagon-like peptide 1 receptor agonists (30–32). The underlying mechanisms of this discordance in response are unknown, but could be explained by difference in drug disposition in different tissues or enzyme activity across different tissues. In line with our data, two previous studies in patients with essential hypertension demonstrated strong and significant correlation in the BP response to ARBs and ACEis (12,33). The importance of individual factors for therapy response was also highlighted by a rotation study of four major antihypertensive drug classes. That study demonstrated that patients either responded to ACEi and β-blockers or to calcium antagonist and diuretics (34). Accordingly, therapy resistance to ACEi and β-blockers could be overcome by switching to a calcium antagonist or diuretic, or vice versa. This supports the idea that a drug-target–based approach to tailor interventions results in optimal therapy response and renoprotection. This study has limitations. First, the selected studies used in our analysis all had small to moderate sample sizes and included a relatively small number of comparisons, which increases the likelihood of chance findings. Second, nearly all studies included only RAASi. We were therefore unable to assess if changes to other drugs or drug combinations improves individual drug response. In addition, our study did not assess whether the doses used were at the maximal effective dose for the individual. Furthermore, we did not investigate whether RAASi at the top of the individual dose-response curve followed by optimization of the diuretic dose and dietary sodium intake will overcome therapy resistance. Plasma drug levels were not available in all studies to verify that patients adhered to study medication. Finally, differences in study designs, trial populations, and background medication may have introduced heterogeneity. However, despite the heterogeneous studies, results remained consistent in subgroup analyses. In conclusion, efficacy evaluation of drugs used to manage kidney and cardiovascular complications is on the basis of efficacy estimation at a group level. Our results confirm previous studies demonstrating that individual patients show a large response variability in multiple risk markers for progression of CKD, and adds that therapy response to RAASi or NSAIDs in several of these risk markers is markedly consistent for the individual. These findings support the idea that specific patient characteristics determine individual therapy response. Elucidation of these characteristics may help to develop tailored mechanism-based therapies to achieve optimal kidney protection. S.I.P. reports no conflicts of interest. D.d.Z. is consultant for, and received honoraria (to employer) from AbbVie, Astellas, Eli-Lilly, Chemocentryx, Fresenius, and Janssen. F.P. and P.R. are employed at Steno Diabetes Center, Gentofte, Denmark. Steno Diabetes Center is an independent academic institution owned by Novo Nordisk and The Novo Nordisk Foundation. F.P. reports having received research grants from Astra Zeneca, lecture fees from Astra Zeneca, Merck Sharp & Dohme, Janssen, Lily, Boehringer Ingelheim, Novo Nordisk, and Novartis, and is a consultant/advisory board member for Astra Zeneca and MSD. P.R. received lecture fees from Novartis and Boehringer Ingelheim, and research grants from Novartis, Astra Zeneca, and Novo Nordisk; has served as a consultant for Merck, Astra Zeneca, Boehringer Ingelheim, MSD, AbbVie, and Novo Nordisk; and has equity interest in Novo Nordisk. R.T.G. is a consultant and/or received honoraria (to employer) from Abbvie, Bayer, Genzyme, Ipsen, and Otsuka. G.D.L. received lecture fees from Sanofi, Astra Zeneca, and Jansen. He served as a consultant for AbbVie, Sanofi, Novo Nordisk, Astra Zeneca, Boehringer Ingelheim, and MSD. He also received a research grant from Astra Zeneca. M.H.d.B. is consultant for and received honoraria (to employer) from Amgen, Astra Zeneca, Baxter, and Vifor Fresenius Medical Care Renal Pharma. H.J.L.H. is consultant for and received honoraria from AbbVie, Astellas, Astra Zeneca, Boehringer Ingelheim, Fresenius, Janssen, and Merck. All honoraria are paid to his employer. L.V. is consultant for and received research grants and honoraria (to employer) from Amgen, Genzyme/Sanofi, Ionis Pharmaceuticals, Pfizer, Unilever, Roche, and Shire. We thank Jeroen Koomen for valuable assistance in conducting the systematic review. The work described in this paper received funding from the Novo Nordisk Foundation, (grant NNF14SA0003). H.J.L.H. is supported by a VIDI grant from The Netherlands Organisation for Scientific Research (grant 917.15.306). These results were presented in part as a poster presentation at the 49th annual meeting of the American Society of Nephrology in San Diego, on November 3–8, 2015. This article contains supplemental material online at http://cjasn.asnjournals.org/lookup/suppl/doi:10.2215/CJN.00390117/-/DCSupplemental.